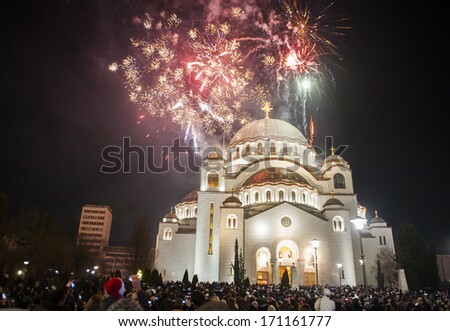 Happy New Year – Srećna Nova Godina! In observation of the Julian calendar, the Old Calendar, today I wish you ALL a Happy New Year. As a result of being an Orthodox Christian who is half Serbian and half Croatian and marrying a man who is a beautiful mixture of Italian, Hungarian, English, and Irish, my huband, two daughters, and I get to have two Christmases and two New Years. It’s pretty slick to get this holiday redo option. Really we are all a melting pot of some other ethnicity beyond being an American, so why don’t we all just observe the OLD CALENDAR today? C’mon, raise your glass, bang your pots and pans, kiss your loved ones, and blow obnoxious noisemakers to ring in the new year (again). If you celebrated two weeks ago, perhaps, like me, you faltered on some or all of your resolutions. Just take another shot at it. “Another New Year, A Better New You!” How do you like that motto? Shortly after January 1st, echoes from the previous year prevented me from feeling completely refreshed, restored, and ready for another calendar month, let alone year. It took a couple extra weeks of reading, praying, and soul searching to get back on track. Ahh! The healing power of Father Time. Instead of itemizing all my resolutions this New Year, I want to simply be better tomorrow than I am today. I have a checklist in my heart, and I’m ready to propel ahead. Happy New Year! Have an amazing 2017 that you dreamed of! Srećna Nova Godina! Previous Post A Judging Squirrel Picture is Worth a Half-Thousand Words. Next Post Weight Loss Goal: I plan to lose four sticks of butter, a chihuahua, and a bowling ball.